The development of adequate motor control and coordination is an important part of general development, allowing an infant to interact with and learn about the world around them and making possible so many everyday activities for children – at home, at school and at play. We know that severe neurological disorders such as cerebral palsy and muscular dystrophy can have devastating effects on movement. But the effects of developmental coordination disorder (DCD) are perhaps less well known. What is our current understanding of the nature and impact of this condition? And how might psychologists help? Jack is 12 years old. He has been in secondary school for two terms and is already finding it hard to cope. In spite of being of above average intelligence, his coordination difficulties are affecting his progress in many subjects. In particular, his difficulty with handwriting is holding him back and even using his laptop does not solve all his problems. Jack lives with his younger sister and two parents. In many respects his early development was fairly typical. However, when he was six years old his parents approached their GP as they, and his teachers, were worried about certain aspects of his development. While there was no concern about his cognitive ability, they had noticed that he was struggling to learn many of the physical skills that most of his peers performed with ease. 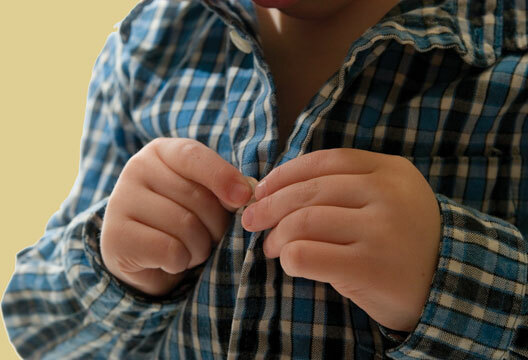 He was unable to button his coat and had great difficulty controlling a pencil to draw or to form letters. He was unable to catch a ball, ride his bike (even with stabilisers) and refused to play on the climbing frame. He rarely participated in games, tending to sit alone on a bench most of the time. In class he appeared to be much more easily distracted than most other children and rarely completed tasks. At home, Jack began to display temper tantrums, unusual for a child of his age. The physical examination undertaken by Jack’s GP failed to produce any explanation for his difficulty in acquiring movement skills. His mother’s pregnancy and his birth had been uneventful; there had been some delays in the development of motor milestones but there were no signs of a definite motor disorder such as cerebral palsy or muscular dystrophy. in the entry for DCD in the Diagnostic and Statistical Manual (DSM-IV) of the American Psychiatric Association (APA, 2000). The case study above outlines the experience of Jack, a 12-year-old diagnosed with developmental coordination disorder (DCD: sometimes referred to as ‘dyspraxia’). Despite having good cognitive ability and the absence of a known neurological disorder, throughout his childhood Jack struggled with school work and activities of daily living. His movement problems have a chronic and significant impact on his academic achievement and everyday life. Jack’s motor difficulties with tasks like running, climbing and bike-riding suggest problems with basic balance and postural control and/or difficulty in coordinating the movement of different parts of his body into one action (e.g. the arm and leg swing while running). With their ‘awkwardness’ and lack of skill very much on display, children experiencing difficulty in this area often choose to withdraw from physical activities, having particular difficulties with ball games (Astill & Utley, 2006). This gives them fewer opportunities to practise motor skills and possibly reduces social contact with peers (Smyth & Anderson, 2000). Reduced levels of activity in children with DCD are also thought to have a negative impact on cardiovascular fitness (Hands & Larkin, 2006). In school it was Jack’s poor hand skills that concerned his teacher most. He was consistently described as a ‘bright’ boy, with an inquisitive mind. His oral contributions in the classroom were good; he has a wide vocabulary and advanced understanding in some areas, particularly science. However, his writing skills have never been commensurate with his other receptive and expressive language skills. He has difficulty forming letters, constantly shifting the pen in his hand, and having to think about where to start each letter. His work rate was extremely slow. After the diagnosis of DCD was eventually made, a classroom helper was allocated to Jack, to whom he dictates his work. This helped both his concentration and greatly increased his output. Two years before he moved to secondary school, Jack also took a touch-typing course with some specialist tuition. Although he was slow to learn keyboarding skills, touch-typing is allowing him to produce legible written work, increasing his ability to communicate through the written word and improving his confidence. Jack’s poor hand skills and lack of manual dexterity are also evident at home. He has difficulty with fastenings (buttons, zips and buckles) and continues to need help with dressing. He also struggles with a range of other self-care tasks including using cutlery and brushing his teeth. From the nature, range, severity and impact of Jack’s motor difficulties it is clear that his experiences are very different from the ordinary ‘clumsiness’ that we all may display from time to time. DCD has a significant and chronic negative impact on the learning and performance of a range of everyday motor tasks. I Performance in daily activities that require motor coordination is substantially below that expected given the person’s chronological age and measured intelligence. This may be manifested by marked delays in achieving motor milestones (e.g. walking, crawling, sitting), dropping things, ‘clumsiness’, poor performance in sports, or poor handwriting. I This disturbance significantly interferes with academic achievement or activities of daily living. I The disturbance is not due to a general medical condition (e.g. cerebral palsy, hemiplegia, or muscular dystrophy) and does not meet criteria for a Pervasive Developmental Disorder. I If Mental Retardation is present, the motor difficulties are in excess of those usually associated with it. Over the years, a variety of terms have been coined to describe Jack’s condition. These include ‘clumsy child syndrome’ (Gubbay, 1975), ‘physical awkwardness’ (Wall et al., 1990), specific developmental disorder of motor function (WHO, 1993) and dyspraxia (Denckla, 1984). The term ‘dyspraxia’, is typically used interchangeably with the term DCD in the UK by the national parent support group, the Dyspraxia Foundation, and by the media. This has led to some controversy and confusion, as the term ‘dyspraxia’ is not included in the diagnostic manuals of either the American Psychiatric Association or World Health Organization. In fact, the term originates from the acquired neuropsychological literature drawing parallels with apraxia, an acquired deficit in the sequencing of gestures. Thus the term ‘dyspraxia’ is used in a more restricted way by some researchers, to refer to a disorder of gesture as one symptom commonly associated with DCD (Hill, 1998). In fact we argue that the use of the term ‘dyspraxia’ causes confusion and poor specification of what the disorder is. Of particular concern is the use of the term recently in a way that bears no relation either to its strict neuropsychological meaning or to the formal diagnostic criteria of DCD. Rather, it seems to be used to refer to a particular pattern of deficits on the Wechsler Intelligence Scales. In our view, this interpretation of the term is inappropriate and lacking any proper validation. In contrast, use of the term DCD, when used together with the published diagnostic criteria, can be helpful and informative. Formal recognition of DCD has been given by inclusion in the DSM since 1987. It remains in the latest text revision and (with some minor definition changes) in the draft DSM-5 as developmental coordination disorder (DCD). Since DSM-III-R was published in 1987, leading international clinicians and researchers have advocated use of the term DCD over other terms (Polatajko et al., 1995) and application of the associated diagnostic criteria is also encouraged, although it is recognised that these require further refinement in the light of increased knowledge and recent research findings (see Sugden, 2006). Do the movement difficulties resolve with time? In the past it has been assumed that children with DCD simply ‘grow out’ of their movement difficulties over time. However, it is now well established that for many these continue at least into early adulthood, with difficulties in writing, driving and sports participation reported, sometimes leading to restrictions in career choices. In some respects movement difficulties may be easier to cope with as an adult, as one has more control over which physical activities to engage in. Of particular concern, however, has been the finding that early motor difficulties are commonly associated with serious mental health problems later in life, including increased rates of substance abuse and suicide attempts (Hellgren et al., 1994). The extent to which psychosocial and psychiatric problems are actually part of the disorder initially or occur as a direct consequence of the motor difficulties is still unclear. Jack, from our case study, displayed frequent temper tantrums at home. His parents noted that these often took place when he was struggling with a motor task and felt they could be attributed to frustration. They have also noted that compared to his sister, Jack seems to have a low opinion of himself. He is starting to show symptoms of anxiety and depression, as well as poor self-esteem and he has reported being bullied by children in his school. Jack’s parents and teachers try hard to boost his confidence by adjusting tasks for him to make them achievable and by praising his effort and achievement, but they do express concern over this behaviour. Low self-esteem, high anxiety and poor peer relations have consistently been reported in children with DCD compared to typically developing age peers (e.g. Skinner & Piek, 2001). It is concerning that these are already evident in children as young as four years old (Piek, 2009) and that there is an increased risk of serious psychopathology in children with DCD (Green et al., 2006). Such findings highlight the likely interaction between motor skill and socio-emotional factors across the lifespan and stress the importance of providing intervention not only for motor difficulties but also for potential mental health and behavioural problems. They also highlight the important role for psychologists in further understanding the relationship between motor development and mental health. Although relatively few psychologists work in the area of typical motor development, psychologists have played an important role in the understanding of DCD. Different levels of analysis have been undertaken with the main focus being on behavioural and cognitive levels. Perceptual and cognitive accounts of the disorder have been advocated. Difficulties in visual- and kinaesthetic-perception are likely to play a role in the disorder, and since these are crucial for accurate skilled movement, when catching a ball or reaching out to take a drink for example, it is easy to see how such difficulties might impact on daily life. Motor programming studies have also highlighted a significant deficit in the planning and control of action (e.g. Henderson et al., 1992), including difficulties in a central timekeeping mechanism (e.g. Williams et al., 1992). One consequence of such difficulties could be inadequate movement prediction (Hill & Wing, 1999). A more recent, neurocognitive account has postulated that children with DCD have difficulty using motor imagery (Wilson et al., 2002). These approaches are reviewed in Sugden and Chambers (2005), and it seems likely that the underlying mechanisms are heterogeneous in this group. Is DCD separable from other developmental disorders? In our case study Jack shows signs of inattentiveness and distractibility at school. This is not uncommon in children with DCD, nor are anecdotal reports of difficulties associated with language, reading or maths for example. Jack’s attention problems are not severe enough to warrant an additional diagnosis of ADHD and he does not have significant difficulties in any other area of development. However, it is now widely recognised that motor difficulties feature in other neurodevelopmental disorders affecting a proportion of those with disorders such as dyslexia (e.g. Ramus et al., 2003), autism spectrum disorder (see Mari et al., 2003), attention deficit hyperactivity disorder (e.g. Sergeant et al., 2006) and specific language impairment (see Hill, 2001). Indeed, some have drawn a controversial causal link between motor and other difficulties (e.g. in dyslexia: Stoodley et al., 2005). Where direct comparisons have been made to the motor difficulties seen in DCD, these have been found to be similar (e.g. Green et al., 2002; Hill et al., 1998). Such findings emphasise the importance of assessing motor competence even in those who have not been identified initially on the basis of a specific motor difficulty. Finally, a recent genetic study in which symptoms of ADHD and DCD were compared reported a strong shared additive genetic component between most subtypes of ADHD and DCD, highlighting the importance of identifying the cognitive endophenotype of DCD (Martin et al., 2006). While some question the existence of separable disorders, drawing on the concept of atypical brain development (e.g. Gilger & Kaplan, 2001), such researchers are in the minority (see recommendations in Sugden, 2006). Our position is that acceptance of DCD as a diagnostic category is invaluable for a number of reasons. First, it draws attention to the effects of movement difficulties on children’s lives more readily than any other system of categorisation. Second, the importance of assessing motor competence even in those who have not been identified initially on the basis of a specific motor difficulty is now evident, and Michelle Pratt’s PhD at Goldsmiths suggested a link between motor skill and mental health in typically developing children. Third, we are not yet at a position where we can clearly describe the motor difficulties seen in different diagnostic categories as being similar or different either behaviourally or at a cognitive or biological level. Finally, it is crucial to investigate the nature and direction of the relationship between motor and cognitive difficulties. Individuals with DCD experience significant difficulties with fine and gross motor control, the planning and execution of movement and in some cases visuospatial skill. Given the importance of movement development, it is essential for psychologists to be aware of and continue to investigate motor development in children and across the lifespan. Unfortunately the mechanisms and processes that may underlie DCD have not yet been clearly elucidated. We believe that investigating the causes and consequences of DCD across the lifespan is crucial if we are to enhance the day-to-day life experiences and outcomes, as well as the academic and employment achievements of those with DCD. Furthermore, we believe that psychologists are crucial in this quest. Their contributions can be widespread, and include the development of assessment tools (and evaluation of their psychometric properties) for diagnosis; understanding the cognitive, perceptual and motor mechanisms underlying the condition; evaluating intervention methods; and understanding the wider issues faced by this population. As DCD is increasingly recognised as a lifespan disorder, it is important not to be searching for a static deficit. Psychologists can also contribute in this regard, with their expertise on investigating the developmental consequences of impairment, and the importance of understanding more about early brain development and the likely contribution of this to DCD. In our view, understanding of DCD will benefit from a more integrated approach to identifying these deficits, with explicit links being drawn between biological, cognitive, behavioural and environmental influences, within a lifespan developmental perspective. American Psychiatric Association (2000). Diagnostic and Statistical Manual of Mental Disorders (4th edn – Text revision). Washington, DC: American Psychiatric Association. Astill, S. & Utley, A. (2006). Ball catching in children with developmental coordination disorder. Motor Control, 10, 109–124. Barnett, A. & Peters, J. (2004). Motor proficiency assessment batteries. In D. Dewey & D. Tupper (Eds.) Developmental motor disorders (pp.66–109). New York: Guilford. Bruininks, R.H. & Bruininks, B.D. (2005). Bruininks–Oseretsky Test of Motor Proficiency (2nd edn). Windsor: NFER-Nelson. Denckla, M.B. (1984). Developmental dyspraxia: The clumsy child. In M.D. Levine & P. Satz (Eds.) Middle childhood: Development and dysfunction (pp.245–260). Baltimore, MD: University Park Press. Gilger, J.W. & Kaplan, B.J. (2001). Atypical brain development. Developmental Neuropsychology, 20, 465–481. Green, D., Baird, G., Barnett, A.L., et al. (2002). The severity and nature of motor impairment in Asperger's syndrome. Journal of Child Psychology and Psychiatry, 43, 655–668. Green, D., Baird, G. & Sugden, D. (2006). A pilot study of psychopathology in developmental coordination disorder. Child: Care, Health and Development, 32, 741–750. Gubbay, S.S. (1975). The clumsy child. London: Saunders & Co.
Hellgren, L., Gillberg, I.C., Bagenholm, C. & Gillberg, C. (1994). Children with deficits in attention, motor control and perception (DAMP) almost grown up: Psychiatric and personality disorders at age 16 years. Journal of Child Psychology and Psychiatry, 35(7), 1255–1271. Henderson, L., Rose, P. & Henderson, S. E. (1992). Reaction time and movement time in children with a developmental coordination disorder. Journal of Child Psychology and Psychiatry, 33, 895–905. Henderson, S.E. & Sugden, D.A. (1992). Movement Assessment Battery for Children. Sidcup: Psychological Corporation. Henderson, S.E., Sugden, D.A. & Barnett, A. (2007). Movement Assessment Battery for Children-2. 2nd edition (Movement ABC-2). Examiner’s manual. London: Pearson Assessment. Hill, E.L. (1998). A dyspraxic deficit in specific language impairment and developmental coordination disorder? Developmental Medicine and Child Neurology, 40, 388–395. Hill, E.L. (2001). The nonspecific nature of specific language impairment. International Journal of Language and Communication Disorders, 36(2), 149–171. specific language impairment. Human Movement Science, 17, 655–678. Hill, E.L. & Wing, A.M. (1999). Coordination of grip force and load force in developmental coordination disorder. Neurocase, 5, 537–544. al. (2003). The reach-to-grasp movement in children with autism spectrum disorder. Philosophical Transactions of the Royal Society Series B, 358(1430), 393–404. Martin, N.C., Piek, J.P. & Hay, D. (2006). DCD and ADHD: A genetic study of their shared aetiology. Human Movement Science, 25, 110–124. Piek, J.P. (2009). The social-emotional implications for children with developmental coordination disorder. Keynote presented at the 8th International Conference on DCD, Baltimore, MD, USA. Polatajko, H., Fox, M. & Missiuna, C. (1995). An international consensus on children with developmental coordination disorder. Canadian Journal of Occupational Therapy, 62, 3–6. Ramus, F., Pidgeon, L. & Frith, U. (2003). The relationship between motor control and phonology in dyslexic children. Journal of Child Psychology and Psychiatry, 44, 712–722. J. (2006). ADHD and DCD. Human Movement Science, 25, 76–89. Skinner, R.A. & Piek, J.P. (2001). Psychosocial implications of poor motor coordination in children and adolescents. Human Movement Science, 20, 73–94. of Developmental Psychology, 18, 389–413. Stoodley, C.J., Fawcett, A.J., Nicolson, R.I. & Stein, J.F. (2005). Impaired balancing ability in dyslexic children. Experimental Brain Research, 167, 370–380. Sugden, D. (Ed.) (2006). Developmental coordination disorder as a specific learning difficulty. Leeds Consensus Statement. Cardiff: The Dyscovery Trust. Wall, A.E., Reid, G. & Paton, J. (1990). The syndrome of physical awkwardness. In G. Reid (Ed.) Problems in movement control. Amsterdam: Elsevier Science. Williams, H.G., Woollacott, M.H. & Ivry, R. (1992). Timing and motor control in clumsy children. Journal of Motor Behavior, 24, 165–172. Wilson, P.H., Thomas, P. & Maruff, P. (2002). Motor imagery training ameliorates motor clumsiness in children. Journal of Child Neurology, 17, 491–498. World Health Organization (1993). The ICD-10 Classification for Mental and Behavioural Disorders: Diagnostic Criteria for Research. Geneva: WHO.